Twitter, some people say Twitter is not hot anymore, rather it is now considered as one of old fashioned social media. Within a small rectangle space, we can write anything but it limits your thought to only 140 words. 140 words might be not enough to express my thought, but these 140 words are more powerful than you think. Anyway, this Twitter becomes a place where support feminine movement in South Korea, I realise. Now, more and more women share their horrific experiences of sexual violence from ‘men’ and ‘society’ surrounding them. It should take courage to share their horrible experiences with others in a public space, Twitter. Last few days, one of victims of sexual violence disclosed a distinguished novelist’s repulsive sexual harassment. So many of female writers and fans had to endure his disgusting behaviour and one of victims decided to write about his hidden dirty side to the world. And this case is starting to encourage other victims to share their experiences of sexual violence that they couldn’t share with others before. People start to retweet their tweets and their tweets widely spread from person to person. Those disgusting sexual offenders live the double life with two faces. Through # (hashtag), we share our stories and these stories will reveal whom they really are to the world. Posted on 23 Oct 2016 23 Oct 2016 by moon ajummaPosted in Smart Ajumma (English)Tagged 대한민국 여성 화이팅, 문단_내_성폭력, 가면을 벗겨라, feminism, 트위터, 우리는 할 수 있다, Korea, tweet, twitter, women's movement. 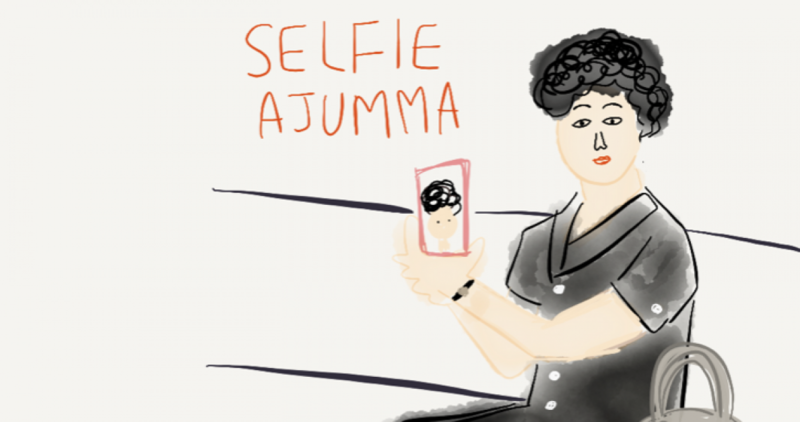 Next Next post: Ajumma Rapstar!